Remember those Superhero Muffins? Meet their cousins Pumpkin Spice muffins. The ‘Run Fast, Cook Fast, Eat Slow’ cookbook has three versions of these healthy muffins – Apple Carrot, Pumpkin Spice and Beet Blueberry Molasses. Since tomorrow is Thanksgiving and all I thought I should probably pause the gingerbread for a day and bake something pumpkin! That was hours ago though. It’s currently 10 PM, we’re watching Life of the Party and if I’m being honest I’m getting real sleepy and the words are not coming to my mind quickly! By the way, this movie doesn’t have the best reviews, but it most definitely has multiple laugh out loud moments. Watch it and enjoy. Now let’s make muffins before it’s just time for bed. In a medium sized mixing bowl, combine all of the dry ingredients – almond flour, rolled oats, pumpkin pie spice, baking soda, salt and walnuts, raisins or chocolate chips if you’re adding some flare. I did walnuts in the Apple Carrot muffins so I decided to go with chocolate chips for these! I’m also not sure if I’d like raisins in pumpkin muffins, but if the chefs list it as a choice it must be one of those questionable combinations that’s surprisingly good! In a separate larger mixing bowl, combine all of the wet ingredients – eggs, pumpkin puree, melted butter and maple syrup. Then gradually add the dry ingredients to this bowl and stir until everything is mixed together well. Spoon the batter into muffin cups and bake for 30 – 35 minutes or until they pass the clean toothpick test. I recommend checking them right at 30 minutes; mine were done at this point and it’s easy to leave baked goods in a few minutes too long waiting for them to ‘look done’. I also highly recommend using parchment paper muffin cups; they won’t stick at all and they have such a nice bakery look! And that’s it! With no real time consuming prep, like grating carrots and apples, these muffins come together in no time! For leftovers, store in an airtight container in the fridge and pack some away in the freezer for later. I always prefer to warm mine up a little before eating! Which is exactly what I’ll be doing in the morning, because we’re having these for a little festive-ness with breakfast tomorrow. Preheat the oven to 350 degrees Fahrenheit. 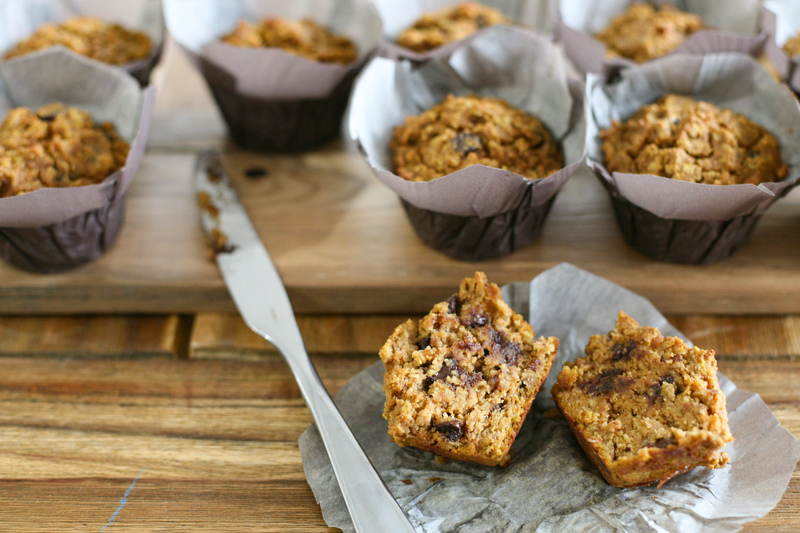 Line a muffin tin with parchment paper muffin cups. In a medium sized mixing bowl, combine all dry ingredients and mix together well. In a separate larger bowl, combine all wet ingredients and whisk together to mix well. Gradually add the dry ingredients to this bowl and stir until the batter is just combined. Spoon the batter into the muffin cups filling each to the brim. Bake for 30-35 minutes or until they pass the clean toothpick test. Store leftover muffins in an airtight container in the fridge - or the freezer if you want to save them for later. If you like them warm like me, reheat muffins in the microwave on low power before enjoying! This entry was posted in Breakfast, Dessert, Recipe Book, Snacks, Uncategorized and tagged breakfast ideas, brunch, easy brunch recipes, fall recipes, healthy muffin recipes, healthy muffins, healthy snacks, holiday recipes, pumpkin recipes, pumpkin spice, pumpkin spice muffins, snacks, superhero muffins. Bookmark the permalink.